Our mission here at Tidelift is to make open source work better for everyone. One big area of focus for us is finding ways we can help those of you whose day jobs are writing applications using open source components. Over the past year, we’ve talked to a lot of folks like you, and we’ve learned more about where the joy and the pain come from when using open source packages in professional settings. 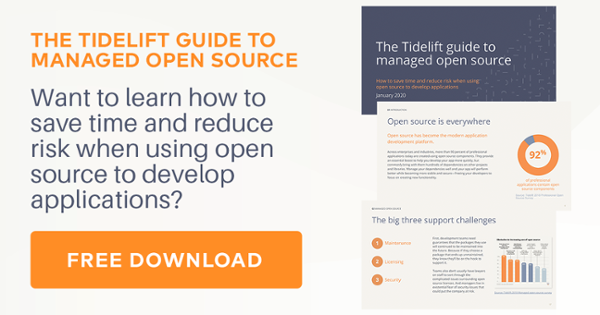 We’ve collected some of the most important things we learned into a report we call the Tidelift guide to managing open source. The new version is available now.